Your difficulty rising in the AM is probably due to those long nights fighting crime. Or you just haven’t put the A/C in the window yet. Either way, you’ve been oversleeping. Yawn contentedly with Wake Alarm, a new iPhone app that involves slapping, shaking and flipping your phone to shut the alarm off, available now. Think of this as a way to punish your smartphone for having the nerve to whistle or beep or chime at you early in the morning. Without being charged with a crime against electronics. It’s pretty easy to use. Start by downloading the app. Then pick your alarm sound (there are 12 of them) and set the alarm time. Then... go to sleep. Seven hours or so later, you’ll hear your alarm. And you’ll forcibly whack your smartphone’s touchscreen to send it to snooze. When it beeps again, you’ll slap it again. 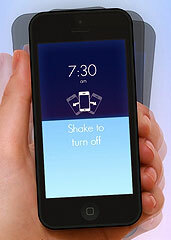 Then again, if vigorous physical activity is your go-to wake-up move, use the shake setting. When the alarm goes off, you’ll have to give your phone some brisk one-handed shaking until the shake-meter has filled on the screen, silencing the alarm. Looks like all that work with the Shake Weight is about to pay off.